Termites in Phoenix AZ are SWARMING! Termites in Phoenix SWARM during MONSOON season and after we get heavy RAIN! SWARMING Termites are reproductive termites that are getting ready to start new colonies. If you have seen large amounts of swarming termites around your home, there is most likely a large subterranean termite colony that needs to be treated to prevent damage. Desert subterranean termites usually swarm at night. After swarming they pair off and go back into the desert soil to start digging out their own new colony’s home. 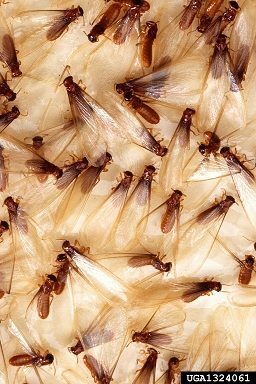 Swarming Termites have 4 wings are all the same size. Swarming Termites have SHORT and STRAIT antennae. Swarming Termites have a STRAIGHT waist or abdomen. Responsible Termite Control Phoenix AZ, Mesa, Glendale, Gilbert, Scottsdale, Chandler, Queen Creek, Maricopa AZ & surrounding areas.